Despina Panayiotou Theodosiou is joint Chief Executive Officer of TOTOTHEO MARITIME, a leading global supplier of equipment and services for satellite and radio communications as well as bridge navigation systems, automated applications, ship repairs and operational efficiency solutions. She has been with the group since 2005. Since 2013, Despina is a member of the Board of Directors of the Cyprus Shipping Chamber and is chairing the Chamber's Development Committee since 2015. Despina is President of Women's International Shipping and Trading Association (WISTA), since October 2017, having previously served as the Secretary of the organization from 2015 to 2017. WISTA is an organization for women in management positions in the maritime sector and currently there are 40 WISTA National Associations with 3000 individual members. 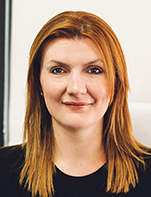 In 2011 Despina founded WISTA Cyprus - a member of WISTA International - and is the Association's current President. She also sits on the first Board of Governors of the Cyprus Maritime Academy and on the Board of Directors of the Cyprus-Germany Business Association. In December 2017 leading international shipping publication Lloyd's List selected Despina as one of the Top 100 Most Influential people in shipping. This publication is one of the main highlights of the maritime year, with its insights into the personalities and trends in the industry. Despina has entered this venerable list for the first time and attained a further credit as one of Lloyd's List's Top 5 Next Generation executive. She won the titles of "Top Professional" and "Cyprus Business Woman of the Year" at the 9th National Cyprus Business Woman of the Year Awards 2015. She has been awarded by the global Women Economic Forum in New Delhi as the "Woman of the Decade in Innovation and Leadership" (May 2017) and named as one of the "10 Women to Watch" by Youngship International during Norshipping 2017. She was also proclaimed as an Honorary Fellow of the Cyprus Institute of Marketing (April 2017). Despina holds a bachelor degree in Economics from the National and Capodistrian University of Athens, an Executive MBA in Shipping and Logistics from the Copenhagen Business School and a Postgraduate Diploma in Financial Strategy from the University of Oxford - Said Business School. Believing in (and advocating for) continuous education, she is currently a participant in the MSc in Major Programme Management at the University of Oxford - Said Business School.